Kristoff se impuso en París por delante del alemán John Degenkolb (Trek) y del francés Arnaud Demare (Groupama), con un tiempo de 2h.46.36. 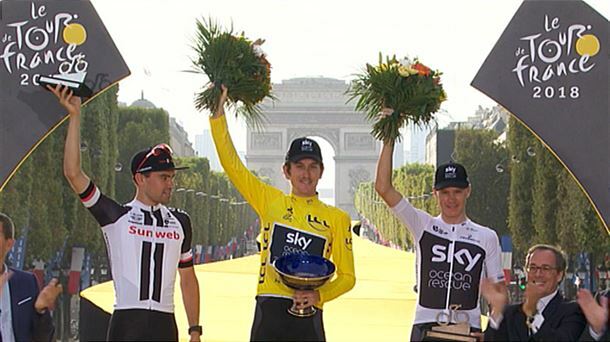 Geraint Thomas entró en meta brazos en alto y al lado de Chris Froome, quien no pudo lograr su quinto Tour. Suben al podio Thomas como maillot amarillo, el holandés Tom Dumoulin (Sunweb), segundo, y el británico Chris Froome(Sky), tercero. 11. Timothy Dupont (BEL/Wanty-Groupe Gobert) - m.t. 12. Thomas Boudat (FRA/Direct Energie) - m.t. 13. Sep Vanmarcke (BEL/EF-Drapac) - m.t. 14. Magnus Cort (DEN/Astana) - m.t. 15. Oliver Naesen (BEL/AG2R-La Mondiale) - m.t. 16. Daniele Bennati (ITA/MOVISTAR) - m.t. 17. Nikias Arndt (GER/Sunweb) - m.t. 18. Edward Theuns (BEL/Sunweb) - m.t. 19. Mathew Hayman (AUS/Mitchelton-Scott) - m.t. 20. Timo Roosen (NED/LottoNL-Jumbo) - m.t. 21. Daryl Impey (RSA/Mitchelton-Scott) - m.t. 22. Damiano Caruso (ITA/BMC Racing) - m.t. 23. Jasper Stuyven (BEL/Trek-Segafredo) - m.t. 24. Dion Smith (NZL/Wanty-Groupe Gobert) - m.t. 25. Jerome Cousin (FRA/Direct Energie) - m.t. 26. ALEJANDRO VALVERDE (ESP/MOVISTAR) - m.t. 27. Laurent Pichon (FRA/Fortuneo-Samsic) - m.t. 28. Domenico Pozzovivo (ITA/Bahrain-Merida) - m.t. 29. Primoz Roglic (SLO/LottoNL-Jumbo) - m.t. 30. Yves Lampaert (BEL/Quick-Step Floors) - m.t.